Biological Conservation has published beautiful photographs and intriguing information about the most seriously threatened animals. 3 tragic cases were thought to be already extinct. The jungle runner lizard, Ameiva vittata, is a scarcely seen Bolivian, with no jungle left to run in, while other tropical inhabitants suffer equally badly from gigantic logging and agricultural increases. 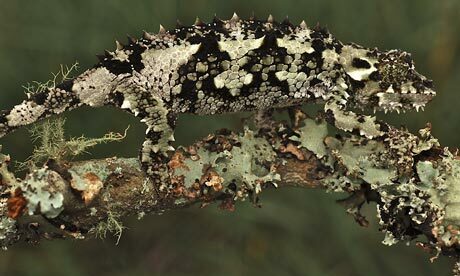 Chamaeleo laterispinis is a spectacular Tanzanian chameleon that is possibly near extinction. The danger of course is that such species survive but we forget the dull little brown creatures. They are at least as important. Monoka Bohm reports on her part of the paper, "Reptiles are often associated with extreme habitats and tough environmental conditions, so it is easy to assume that they will be fine in our changing world. However, many species are very highly specialised in terms of habitat use and the climatic conditions they require for day to day functioning. This makes them particularly sensitive to environmental changes." The highest risk of all is to freshwater turtles, with up to 50% near-extinct, more than matching the well-recorded dangers to the bigger sea turtles. Trading has probably contributed to this particular tragedy, along with many others. Many Anolis lizards (at least 6 species) are at risk in Haiti, this down to the deforestation that has devastated the island, alongside their other disasters. Other reptiles are so little known (or even heard of), according to the ZSL, that they could be extinct without even being recognised. The amphisbaenians are a case in point - have you heard of them? The Red List Authority of the IUCN regard the priority as preventing habitat loss (eg. Tropical forests) along with the blatant harvesting we so often report. Threats are very high on oceanic islands and tropical zones such as central Africa and SE Asia. There are 10,000 reptiles. All are not threatened, such as the green Iguana iguana we showcased yesterday. One of our readers reported they're cruelly using them for meat, to cut the population. The report's final conclusion is that 5,000 of those reptiles are vulnerable, which means that any future changes could lose half !